Storage: Leeks will keep very well for several weeks in a plastic bag in the fridge. If you keep them for longer than that, you may notice the outer layers yellowing or browning; just peel these layers off, rinse the leek, and use the rest as normal. To Prepare: Chop off the top, with the dark green leaves, and the bottom, with the little root nubs. (Discard these, or use them to season long cooking soups or stocks.) Many recipes say to only use the white part, but we always use the light green parts too; we find them just as tender and it’s a lot less wasteful. If there is dirt between the layers, make a single “vertical” slice from the top of the stalk down about 1/3-1/2 of it’s length and fan these layers out until running water. Then, proceed as your recipe indicates. 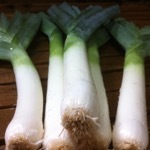 To put by: Leeks freeze really well. Trim and prep them as normal, then chop or slice them and pack them into freezer bags and freeze. They’ll be perfect all winter for soups or sauteing. On the other hand, if you don’t mind removing a few slimy leaves, just keep them in a plastic bag in the fridge; they will last for several months.